Four months ago, a friend of mine sent me a message that said, “Worker cooperative + card game. This is right up your nerd alley.” My friend apparently knows me well, because I was immediately excited by Lixivium Games and their new card game, Laboratory Mayhem. The first thing that struck me about Lixivium is that they are a worker-owned cooperative: this means each worker has one equal share in the ownership of the business, and the workers govern the company democratically. Make Big Things is also a worker cooperative, and so it was amazing to find another burgeoning game company that shares our principles and structure. 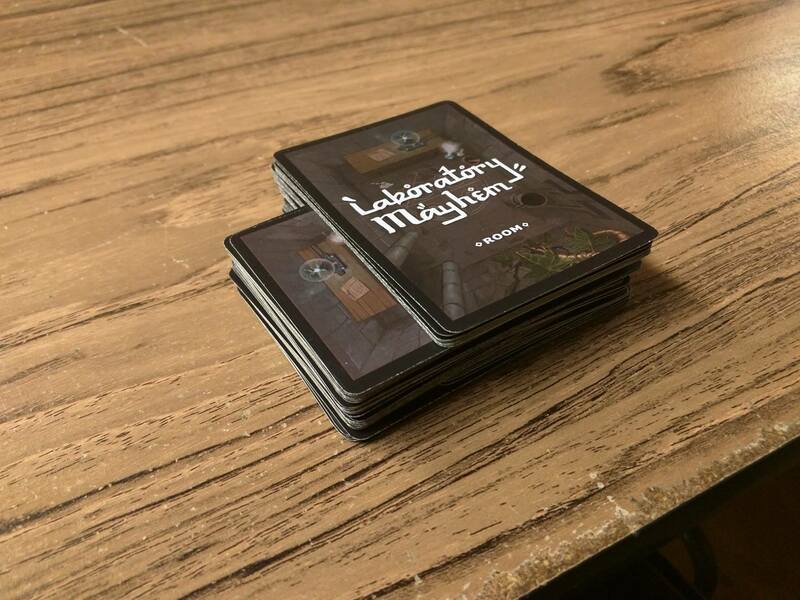 And Lixivium’s flagship project, Laboratory Mayhem, was a game after my own heart – a collectible card game like Magic: The Gathering, but more accessible in terms of game play and affordability. Now, after years of work, the creators are bringing Laboratory Mayhem to Kickstarter. (Join me in backing it – there’s 48 hours left to go! It ends on Thursday, March 2, at 11:40 EST). Several of the worker-owners were also kind enough to sit down with me and chat about why they chose to form as a cooperative as well as their design process for their game. A Laboratory Mayhem prototype: credit to Laboratory Mayhem’s Facebook. Brian: So why did Lixivium Games decide to be a worker cooperative? David: I think workers should always own their work (the normal relationship of owner and employee is exploitation). I also believe democratic processes tend to produce better decisions than autocratic ones, and thus should be applied in the economic sphere as well as in the political sphere. Greg: We were friends before we were coworkers, so we wanted all of us to be treated fairly. Same for everyone else who contributed to making the game later on. Giving everyone who contributed a say, and compensating everyone proportional to their effort, seemed like a no-brainer. Brian: Do you think the fact that you are a cooperative has shaped the design of the game at all? David: In so many ways. Many things from our game name to the number and types of alchemy available were subjected to lengthy discussion, rather than just having one person decide how it should be. Also, very importantly, game play is partly determined by the monetization plan. We were all on the same page to make a broadly accessible game, rather than maximizing profit (the typical decision in a capitalist-owned corporation). Greg: Absolutely. To add to what’s been said, it’s been a huge factor in bringing in contributors besides us original five. Because we’re self-funded, company ownership is our primary compensation. A lot of our artists appreciate our intent and the spirit behind the game, even if it means they’re not getting sizeable up-front payment. Myles: We’ve had a lot of practice on our communication skills over the years. When everyone has the right to weigh in, you have to be conscious about your design decisions and willing to defend them. 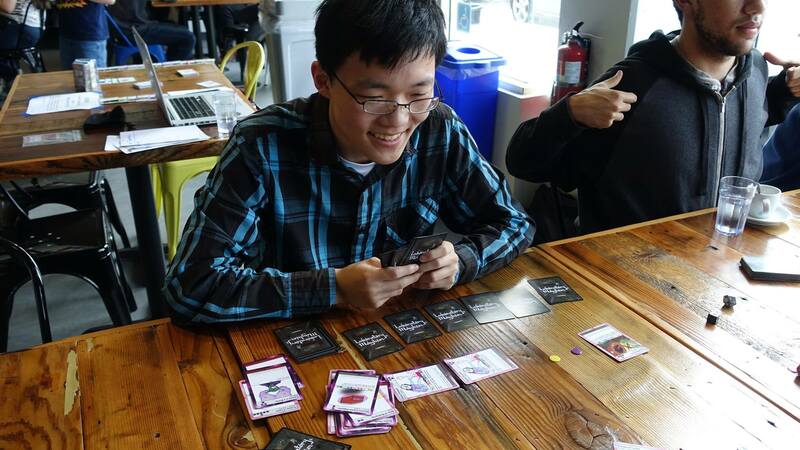 A prototype of Laboratory Mayhem being played at Victory Point Cafe in Berkeley, CA. Credit to Laboratory Mayhem’s Facebook. Brian: I can’t wait to get my copy of Laboratory Mayhem. One thing that really appealed to me is how you worked to ensure every card had multiple uses so there are no wasted turns. What drove you to do this, and what’s been players reactions? David: In any game where you draw cards, there will probably be some element of randomness, and our game still has some. But we really wanted to avoid situations where straight out of the gate you can’t do anything but wait, because you lack the cards or resources to make your first moves. This is a horrible feeling (essentially the game is decided/ruined before it starts) that all of us have experienced at some point playing lots of other games, and that’s why we knew we absolutely wanted to avoid it. Greg: Games should be fun. But a lot of strategy card games have moments of helplessness, by no fault of the player, and that’s anti-fun. Being able to use any card three ways means you can always do something meaningful to advance your position, so no more feeling helpless, and a lot more feeling fun. Andrew: Players have consistently given positive responses to being able to play the cards three different ways. I love watching new players realize that they can still play cards as rooms in the endgame – finding uses for cards in their hand even though assembling the card wouldn’t be useful in that situation. And when that extra room suddenly changes the endgame combat math, it’s even more dramatic and exciting! Cards from Laboratory Mayhem. Credit to Laboratory Mayhem’s Kickstarter. Brian: One comparison for Laboratory Mayhem seems to be Magic: The Gathering. I used to be an avid Magic player, but in the last year I’ve somewhat given it up because I couldn’t keep up with always having to buy new cards that were coming out. Your Kickstarter says that all the cards needed to play the game will come in one box in order to make it accessible. Why was this so important to you? David: For exactly that reason. We don’t want to squeeze uncomfortable amounts of money out of our customers. We want people to spend 30-100$ dollars per year on our game, rather than hundreds or thousands. It seems a fair price for the entertainment they will receive, and a fair price for the work we’ve put in. It should also eventually allow more people to play the game. Greg: In addition to general good-will, we know a lot of our players will be folks who play Magic or other wallet-hungry CCGs. We don’t want to make anyone choose between our games, so by offering a complete set for a fixed cost, it’s easy to play both. Brian: What can we look for in the future from your cooperative? 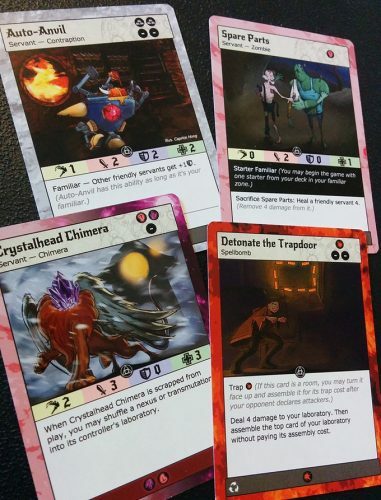 David: I think a second set of cards for Lab Mayhem would be a lot of fun: we’ve scratched the surface of our design space, but as designers, we can all see a lot of unexplored territory, and it beckons to us. Every one of the five founders also has more ideas for other games, so we might also try to put some of those out. Thanks to Lixivium Games for taking the time to speak with us about worker cooperatives and their game, Laboratory Mayhem! You can back the game on Kickstarter here until Thursday morning, March 2. Subscribe to our mailing list for game updates, interviews, coupons, deals, and more!